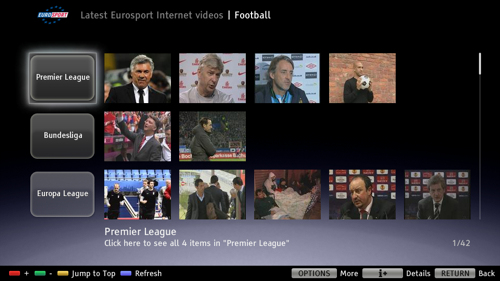 Sony has added EuroSport content to its Bravia Internet Video IPTV system. 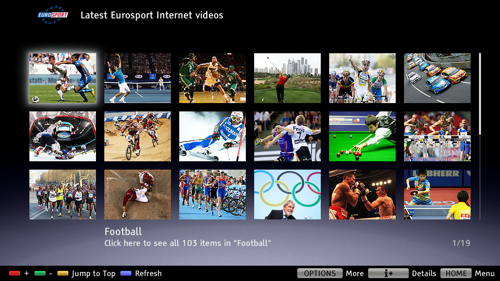 A full range of online sporting video clips are available on demand directly from Eurosport's online video catalogue, including footage from the worlds of football, tennis, cycling, motorsport, winter sport, snooker, golf, athletics and more, Sony said. Bravia Internet Video appears on Sony's 2010 HD TVs and Blu-ray Disc players. It allows devices hooked up to a broadband link to display online content from the likes of YouTube, Lovefilm.com, Daily Motion and the Berlin Philharmonic.